You can read my review of The Kiss of Deception (The Remnant Chronicles #1) HERE and Kayla's review HERE. 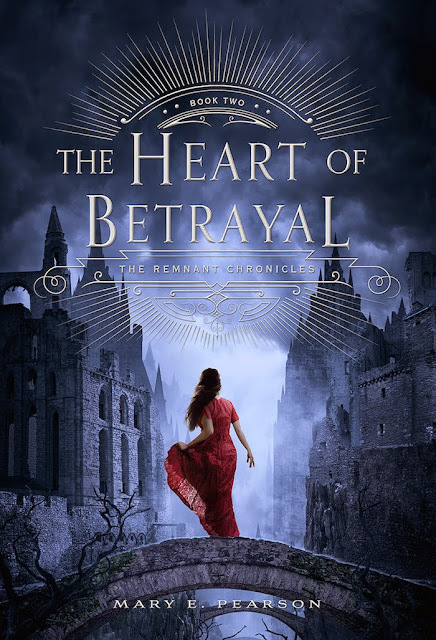 I was worried I wouldn't like The Heart of Betrayal because one of the reasons I loved the first book, The Kiss of Deception, was that I never knew who the prince and assassin really were. I loved the guessing game and the intrigue, but I did wish for a little bit more of fantasy. This is a completely different book, but I think I may have liked it even more. There's much more world-building, and there's a lot more magic involved. Lia was an exceptionally awesome heroine. I liked her in The Kiss of Deception , but I loved her in The Heart of Betrayal. She wasn't perfect and she was willing to do just about anything to get through, but I loved her backbone. She wasn't willing to just lay down and die, or lay down and let the the Komizar order her around for his own means. Man, what a piece of work there. I still never forgave Kaden, and I don't understand his blind loyalty to the Komizar. The Komizar is only worried about his own power and not his people. He was a sociopatch or psychopath with a huge ego whose seemingly only purpose is to soothe his ego by attacking Morrighan. I am glad that the love triangle was pretty much resolved, although Lia does play it up for her own means and survival. I can't even blame her as she was lied to and kidnapped by one member of said love triangle. I was worried for a little while that there would be a love square with the Komizar, especially since the synopsis says something along the lines of the Komizar not being who she thought he would be. Thankfully, it's just another ploy for survival, and not any sort of affection on Lia's part. I liked that we got to see more of the past, and I'm sure that this is the future of America. I really wish that Lia would have more glimpses of her gift. I think that Lia is needed more in Venda than in anywhere else, especially in hopes of uniting the kingdoms. I don't know how Lia's need in Venda is going to be reconciled with her relationship with the prince of the other kingdom, but I can't wait to read about it next. I thought that the Pauline chapters didn't really add a whole lot to the story, except to tell us just how despicable some of the people of Morrighan truly were. I hope this isn't just a trilogy because I want so much more from the world than if the series only has one more book. We have so much more to learn about the Song of Venda and Lia's destiny and what happened between the kingdoms. But, why oh why did it have to end like that?? If you liked The Kiss of Deception, I hope you enjoy The Heart of Betrayal as much as I did. If you love a fantasy story with a heroine that only grows stronger throughout the books, then you should start this series! To satisfy FTC guidelines, I am disclosing that I received an advance copy of the book briefly for reviewing purposes through Around the World ARC Tours in exchange for an honest review.The book was likely provided to the tour by the publisher or author, which has in no way affected the outcome of my review. Between you and Amber, I'm even more excited to read it now!